Trimming, tacking, jibing, and other nautical terms are ones I am not used to hearing, nor understanding, but soon had to learn after being lucky enough to be invited to race in the 2012 Koh Samui Regatta aboard Kindred Spirit, the pride of Saard’s Watersport Center. I’ve had plenty of experience being out on the water, usually on a surfboard, a ferry, or speedboat, but never on a sailing boat and never as part of a race. It was an unexpected invitation, but one that I accepted with childlike enthusiasm. 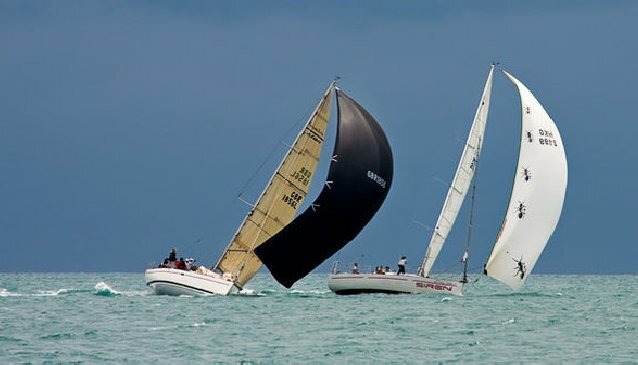 The regatta is one of the annual events in Koh Samui, now in its eleventh year. A variety of sailing boats, predominately based around South East Asia, come up to take part in 5 days of racing off the coast of Koh Samui. It’s a great mixture of serious race teams, sailing families and local enthusiasts all bonded by one common love, the call of the sea and the challenge of racing. Not really knowing what I was in for fortunately, we had a practice day before the real racing began, or so I thought. As we motored out to the starting point for our practice race, the excitement began to buzz as racing boats of all sizes crisscrossed the water heading for the starting line. This is when we put our sail up and began doing the same until suddenly, without warning, a storm whipped up 50 knot winds and torrential rain. There was bedlam on the boat as the sailors furiously manoeuvred the sail to protect it from the elements. Meanwhile, we couldn’t see more than 20 feet in front of us. Getting the boats back to the safety of Chaweng Bay became a priority for everyone. While I was looking forward to the prospect of returning to dry land, this unexpected chaos was quite exciting to witness (and thankfully no one was hurt). Our first day racing was a little more relaxed, the wind was still present but we didn’t endure the same conditions as the previous day. Sailing a course that took us along the east coast of Koh Phangan, we were able to relax and enjoy the view while the boat, our Captain Saard, and his tactician, Michael, did all the sailing. The second day was pretty much the same, less wind, more sunshine and lots of scenery as we sailed along the southern end of Koh Phangan and the north-eastern side of Koh Samui. To see these islands from this perspective was absolutely beautiful, and I noticed a few tiny islands and beaches that I didn’t even know existed. The final day of the Regatta was when all the carnage occurred. The wind started gusting up to 35 knots and the ominous signs of serious weather coming right at us were shaped in the form of roaring, thunderous swells. Sure enough, it hit us with full force. Again the team worked furiously to keep the boat racing while protecting our mast and sail. On the radio you could hear call after call of competing boats announcing that they were retiring from the race. Some were less fortunate than others, sails were torn and, on one rather large catamaran, the mast actually snapped entirely from its base. Our crew were very lucky to escape without injury and they ensured our safety by making us stand at the back of the boat. My hat goes off to Saard, Michael, Gok and Noi; they really demonstrated their skill and determination to sail our boat to the finish line despite the 2 metres swells. Considering the boat was built for luxury, and not for racing, we also did quite well, coming third on the day and winning a trophy for the race in our category. As much as I enjoyed the racing, however, the best way to enjoy this beautiful boat is on a sailing vacation or sunset cruise. Skimming across the calm seas to a deserted beach is exactly what this boat was built for. If you are interested in doing so while here in Samui, then Kindred Spirit is one of the best boats, with the most dedicated sailing team, that you could ever choose. Finally, for a visual account of this regatta racing, check out our Samui Regatta 2012 page for photos of the final day’s racing.